Lord Duncan Stewart passed away on February 3, 2019 after many years of battling debilitating health challenges. 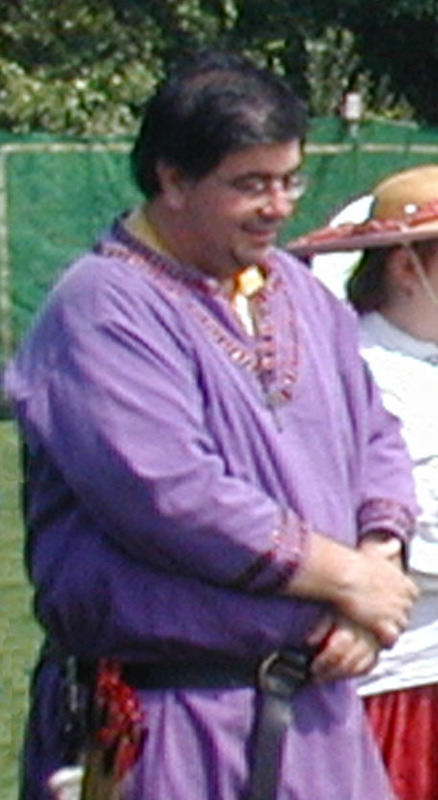 Although he had not been active in the SCA for the past ten years or so, he was well-known in the archery community, especially in his home Barony of Carolingia. Duncan received his Award of Arms from Andreas and Isabella on Feb. 3, 2001. 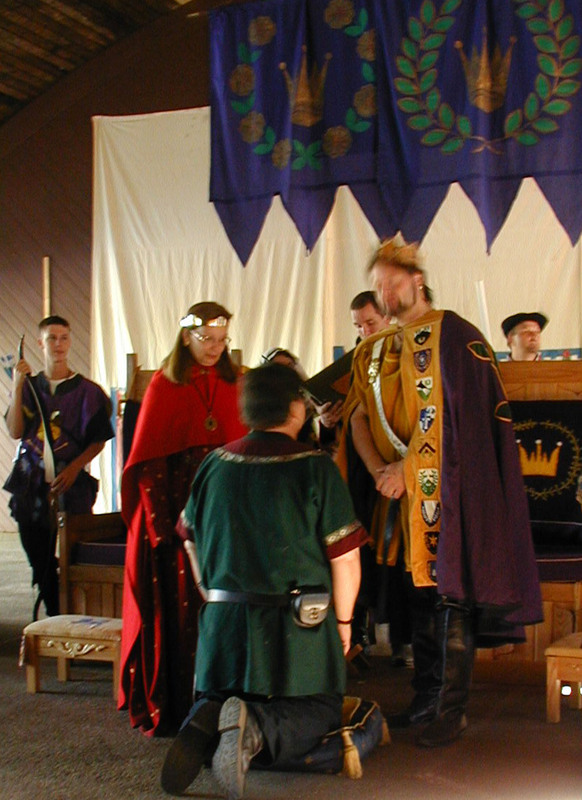 He achieved Grand Master Bowman ranking on June 24, 2001, and was presented with his badge and a scroll by Hanse and Olivia on Sept. 15, 2001 at Legends of Chivalry. 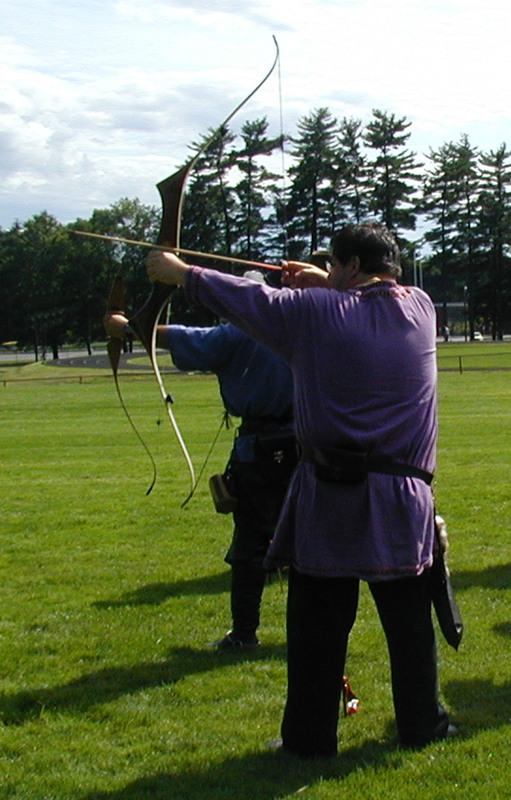 He served twice as Archery Champion of the Barony of Carolingia, winning the competitions on June 27, 1999 and July 10, 2004, then running the tournements to select his successors. Duncan made a generous gift to the Carolingian Company of Bowmen when he had the guild’s charter professionally framed. Properly protected, the venerable document is displayed with honor in the home of the Company Captain. In the modern world, Duncan was known as Anthony Bellettini. He welcomed SCA archers at the indoor shooting ranges in the pro shops he operated, and he served as the Director of Shooting for many regional archery competitions. Anthony was a Certified Level 4 Coach, and he delighted in helping many people learn the sport he loved – especially the young archers in the JOAD program. The Memorial Service for Anthony Bellettini will be Friday, February 22, 2019 from 9am to 10am at the Folsom Funeral Home (86 Milton Street in Dedham MA) followed by a funeral procession to the Brookdale Cemetery (86 Brookdale Avenue in Dedham MA). Photos by Ygraine of Kellswood. Master Dorio of the Oaks, Baron Stonemarche, passed away unexpectedly on Tuesday, 7/24. The family is with Anastasia and are hanging in there. If you want to reach out, please use texts, email, or private message. However, she is not up to phone calls or visitors right now. Calling hours will be held at the Rivet Funeral Home, 425 Daniel Webster Highway, Merrimack, NH on Monday 7/30 from 4 – 6 PM. A Memorial Service will be held in the chapel of the funeral home at 6 PM. A memorial will also be held at Pennsic on Monday, 8/6 at 7 pm at the EK battlefield pavillion. Please bring your own chair if able. A book will be available for memories at both memorials. Please feel free to contact his proteges, Simona bat Leone or Fortune St Keyne for further information. Stories, songs, and poems about Duke Kenric are being collected in an online Google Form. The works submitted will be laid out, printed, and given to his family. Anyone may submit a story, which can be as long or short as the person wishes. Final stories will be edited for spelling only; no other edits will be made. If you would like to submit a story, the form can be found here.